If these aren’t the glory days of summer we don’t know how they could look any better. Sunny days, cucumbers and melons to snack on, fewer than 20 mosquito bites per minute, smiling faces, and tomato sandwiches for lunch. Soak it in! Now of course the temperature has felt like fall all along — remember that great word “Septober” — but with the light changing, later sunrises and earlier sunsets, this time of August always makes us stop and look around to figure out if it’s fall already. It’s a lovely time in so may ways, and a great great time to be eating locally in a northern climate. As the harvest gets heavier and yields continue to look good, and the forecast is for warm and dry weather, your share of the bounty is getting bigger too. This week we’re going to try to make it even bigger than last week, and see if the farm is producing enough to move the white bag size on the durables table to one full bag. You might remember that for the last couple years yields have been so moderate that we’ve barely gotten to 3/4 of a bag, if at all. So we love the years when there is this much food on the farm and we can send more home with you. If it’s too much, don’t worry, pass it around to neighbors or friends or family, and/or any amount you don’t take will go to the food shelf. Our donations there this year are already bigger than the last couple years, which feels equally good, and we expect they’ll get a little bigger in the coming weeks. Of course it might not be possible, we’ll see how much the plants give us, and a downturn in the weather could put a halt to some of the crops in a hurry. Cool and wet weather is what we want to avoid in August more than any other time, as it slows ripening and encourages plant diseases. Even with the cool nights we’ve been having, right now things are picking up speed ripening and looking fairly healthy, but a cool, wet spell could undo that pretty quick. The current forecast is looking good though so we’ll eat it up while we can. And the other bounty-shortening event we’re usually watching for this time of year — “tsorf.” A full moon anywhere near September seems to carry an increased risk of the aforementioned chilly nighttime event, and with a heat wave forecast during this week’s full moon, we’re guessing we’ll cruise past this one. We’ll wait and see for the next full moon, but the current long-term forecast is for a warmish fall. Every farmer around here will be glad to hear that, and eaters will reap the benefits too. 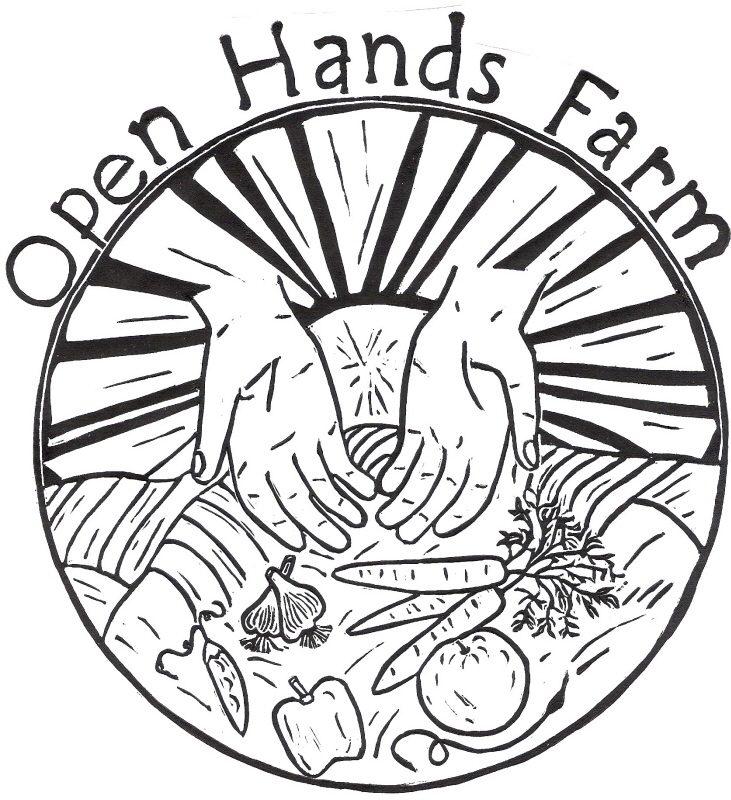 Finally, since sharing the bounty of the Earth is our major goal with this farm, we are pleased to announce we’ve been participating in an exciting program called Harvest For The Hungry, with the Emergency Foodshelf Network in New Hope, MN. There are more details in the Nuts and Bolts section below, but in short it means that generous donation from a couple businesses and private folks like you enable EFN to purchase fresh local produce from farmers like us, for EFN to distribute to people in need via 200+ food shelves, soup kitchens and meal programs. Now we’re probably the world’s worst fundraisers, but It’s a dreamy relationship for us, a great benefit to people seeking food assistance, and you can help fund the program with your donations. A twenty dollar donation translates to twenty pounds of fresh, local (and in most cases organic) produce being distributed to a family who needs it for their health and well-being. Donations can be sent to EFN or dropped off with us; see below for more details. Feeding our community in so many ways is deeply satisfying to us. The CSA is the core of this farm’s business, and your support by eating from the farm year after year is what keeps us going, and helps us make even more contributions to the local food system such as this relationship with EFN. Thanks for all you do, for us and for all! We wish you a happy and peaceful end of summer and transition to fall. Melons are here! Canteloupes should start sometime soon, and together with watermelons there’s lots to go around. We average a four-week melon season, and the plants look healthy and are holding enough fruit to go that long. As with anything else, please give us any and all feedback on melons. 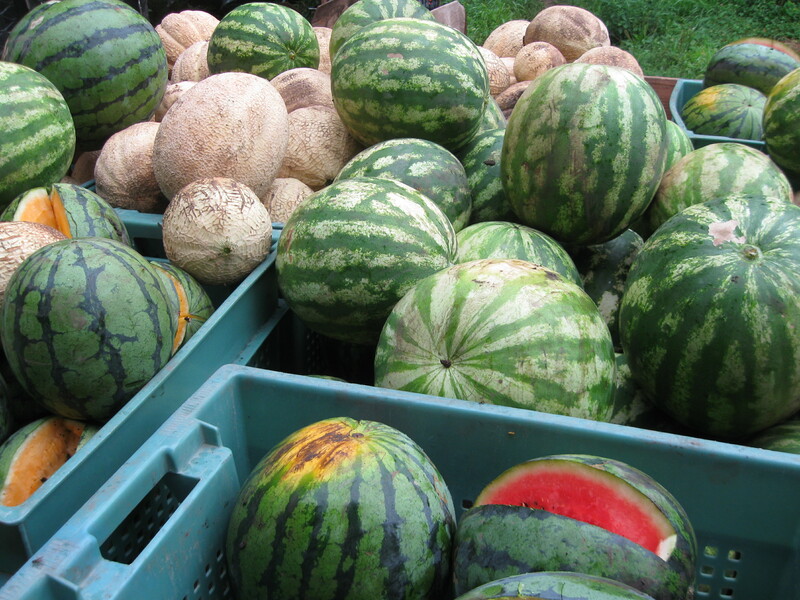 Last week’s watermelons we’re especially curious about–we think some were a little grainy, and some also had “hollow hearts.” We always try to get you the best melons, period, and were confident these tasted great, so hopefully they hit the spot even with those qualifiers. This week’s melons are looking even better, so enjoy! This forecasted heat is what we were hoping for, and the tomatoes will hopefully kick into full gear the next week or so. That means a few more in your share, and by next week we’ll probably have tomato boxes for freezing, canning, making sauce, etc. We’ll let you know with a separate email when they’re ready. Right now we’re mostly harvesting early-ripening hybrid tomatoes. They’ve been tasting better and better, and soon we’ll also be picking pink, orange and a few striped heirloom varieties. The heirlooms all have slightly different flavors, and while only the best are big and crack-free enough to make a few big slices for a sandwich or to go under an egg, they all taste great or else we wouldn’t grow them. Of course different ones also do better than others each year too. The heirlooms make up a little less than half of all the tomatoes we grow. They’re especially likely to crack with any rainfall, so this dry weather bodes well for them. Peppers should start turning red by the end of the month. In the meantime we’ll eat green bells and Cubanelles. The reds are really where the flavor is though, we’re very glad again for this heat to make sure they ripen up! Eggplant is gorgeous and productive this year. Remember you don’t have to peel the Asian ones, they’re all great roasted or grilled, and the globes can make an awesome eggplant sandwich. For onions, sweet onions are done but we’ll start picking storage onions in full force tomorrow. So the onions from now on will be strong and pungent, and for the next couple weeks please eat them within a week or two. They won’t be cured yet, but they will start to cure on their own if you keep them in a well ventilated spot in your kitchen (not in your refrigerator). It looks like a beautiful crop and we’ve had to keep postponing the harvest so hopefully we’ll get them all pulled into the greenhouse in the next couple days. We’ll start picking celery this week too. Unblanched celery like ours is more green and flavorful than celery grown in milder climates. So it’s great for cooking but, for most of us, too stringy and tough for dipping raw or eating ants on a log. We should have it until cold weather takes it away, and then we’ll switch to celeriac. Sliced fine it can work well in a raw tomato salad or soup, such as gazpacho, give it a shot. It is best stored in your fridge in a tightly sealed bag. It keeps coming! Cherry tomatoes are picking up speed, gradually, and should be in full swing here soon, especially when the red ones start coming more fully. Green beans still going well. Tomatillos are trickling and should have more ripening soon (they are ready when they fill out their husk), and a few ground cherries. For yummy herbs: cilantro, basil, dill, parsley, oregano, thyme, cutting celery, and marjoram. Raspberries are probably a couple weeks away. Mmmmm, flowers. Suggestions are welcome on other flowers we could plant in the mix, especially early- and late-blooming annuals. This week’s selection is : Lettuce Mix for $5 / lb, Carrots, Beets, Cucumbers, Zucchini, Summer Squash for $1 / lb, Asian and Globe Eggplant & Broccoli for $1.75 / lb, Collard Greens for 3.50 / lb, Watermelons and Cabbage for $.50 / lb, maybe Cantaloupes for $.85 / lb. Bulk tomato boxes will probably be for sale by next week. We’ll let you know with a separate email, and you can place an order then. Our favorite way to preserve them is to cut the tops off, roast overnight in a 200 degree oven, cool, and put in freezer bags. The roasting concentrates the flavor and all winter we pull out bags for soups, into beans, etc. Our scissors keep on disappearing, so unfortunately we will no longer be supplying them for U-picking. We’ve tried putting our name on them, tying tags on and a few reminders, and a few batches later we’re again down to zero. So from now on please bring your own for picking flowers and herbs. They’re not needed for basil, but are preferred for the other herbs. Keep a pair or two in your car, or with your reusable bags, so you’ll have them when you get here. You may also want to bring a pair of pruners for sunflowers, those stalks can be pretty tough on scissors. We have a few kid scissors left, so if you forget scissors, you can use those. Emergency Foodshelf Network created this program six years ago to address the barriers preventing low-income individuals from purchasing fresh produce. As local need continues to be prevalent, this partnership between Emergency Foodshelf Network (EFN) and local CSA farms supports local growers while providing local produce at no cost to those visiting food shelves. Funds for the program are used to purchase produce from over 30 local farm partners throughout MN and WI each year. All produce collected through the program is delivered to a network of food shelves, on-site meal programs, and hunger relief agencies for free. In 2012, EFN was able to distribute more than 100,000 pounds of fresh produce by working together with local farms. Fresh produce is often more expensive than many other types of food and often seen by low income consumers as a luxury item. Along with being a good source of many important nutrients, consuming a diet high in fruits and vegetables is associated with a decreased risk of many chronic diseases, including heart disease, stroke, high blood pressure, diabetes and some types of cancer. EFN is a full service food bank, providing quality, nutritious food and support services to over 200 food shelves, on-site meal programs, subsidized housing and other hunger relief programs throughout the state of MN. EFN focuses on distributing nutritious foods through innovative programs that serve the hunger needs in our changing communities. —- Click here to donate via EFN’s website. —- Checks can be made out to EFN, with “Harvest For The Hungry” written in the memo line. They can be mailed directly to EFN at 8501 54th Avenue North, New Hope, MN or brought to us and we’ll be happy to send them in. This is another great part of the local food system and local economy, so thanks for your contributions! Finnegan’s Beer, whose mission statement is “Turning Beer Into Food” — is the major contributor to Harvest For The Hungry, so if you drink beer, drink Finnegan’s! And know it helps folks eat better and be healthier. Cook the pasta according to the package directions, drain, rinse with cold water, and set aside. Meanwhile, prepare a dressing by whisking together the soy sauce, oils, lime juice, and cayenne. When the noodles are cool, toss with dressing to coat. Stir in the cucumbers, additional vegetables (if desired), green onions, cilantro, and sesame seeds. Wondering what to do with the Napa Cabbage? Here are 8 different ways to prepare it.